GOP lawmakers say they have heard new stories about political bias or interference within the FBI on the eve of new testimony Thursday by FBI Director Christopher Wray. Rep. Ron DeSantis (R-Fla.) said Wednesday he interviewed a recently retired FBI supervisor who told him he was instructed by Deputy Director Andrew McCabe not to call the 2012 Benghazi attack an act of terrorism when distributing a report on the FBI findings to the larger intelligence community. The agent found the instruction concerning because his unit had gathered incontrovertible evidence showing a major al Qaeda figure had directed the attack and the information had already been briefed to President Obama, the lawmaker said. In the days after the 2012 attack, Obama administration officials initially said it was related to spontaneous Muslim anger over an anti-Islam video tape and not a planned-out act of terrorism. DeSantis argued the example highlights the politicization of the FBI. “What operational reason would there be to issue an edict to agents telling them, in the face of virtually conclusive evidence to the contrary, not to categorize the Benghazi attack as a result of terrorism? By placing the interests of the Obama administration over the public’s interests, the order is yet another data point highlighting the politicization of the FBI,” DeSantis said. DeSantis and several other lawmakers say they plan to press Wray at a hearing Thursday before the House Judiciary Committee about growing concerns that certain FBI supervisors allowed political bias to cloud judgments or decisions. FBI officials did not immediately return a call seeking comment about DeSantis’s allegations. The effort comes days after President Trump lashed out at the FBI. Trump was angered by the news that an FBI official working with special counsel Robert Mueller had sent anti-Trump and pro-Hillary Clinton texts to a girlfriend. Mueller removed the married FBI agent from his team. Trump and his allies, including DeSantis, argue the FBI has taken a much more forceful approach to investigating Trump than they did when Clinton was being probed for her use of a private email server as secretary of State. “The data points we have regarding politicization are damning enough but appear all the more problematic when viewed against the backdrop of investigations whose ferocity seemed to depend on the target: the Clinton case was investigated with an eye towards how to exonerate her and her associates, while the Russia investigation is being conducted using scorched earth tactics that seek to find anything to use against Trump associates,” DeSantis told The Hill. He said he also had talked to another whistleblower who witnessed a video teleconference last February between bureau leadership and their special agents in charge on the day former Trump national security adviser Michael Flynn resigned over lying to Vice President Pence over his contacts with Russia’s ambassador to the United States. Flynn pleaded guilty on Friday to making false statements to the FBI. DeSantis said the person he spoke with said a senior FBI executive made an inappropriate comment suggesting the bureau had a personal motive in investigating Flynn and ruining his career. DeSantis wants the FBI to tell him if the videotape was saved. “The wildly divergent ways these investigations have been conducted appear to dovetail with the political bias that has been uncovered,” DeSantis said. The FBI counterintelligence agent removed by Mueller, Pete Strozyk, played key roles in the Russia investigation into Trump as well as the classified email probe that ended with no criminal charges against Hillary Clinton. A few weeks before Strozyk’s revelation, Justice released records showing his boss, former FBI Director James Comey, originally concluded that Clinton’s transmission of classified information across her insecure private email account was “grossly negligent,” a term that supports a felony charge. But that term was edited out and replaced with “extremely careless” by the FBI before Comey made his final announcement, the documents show. The records also show the Clinton email probe was given “special” status to be controlled only by a small team at FBI headquarters instead of entrusted with the field offices that normally investigate crimes. Meanwhile, the Justice Department inspector general and the U.S. Office of Special Counsel are both investigating whether McCabe, the FBI deputy director, violated the Hatch Act or engaged in improper ethical conflicts when his wife ran for Virginia state senate in 2015 as a Democrat. His wife received $700,000 in campaign support tied to Virginia Gov. Terry McAuliffe (D), a Clinton ally who was under investigation by the FBI at the time. 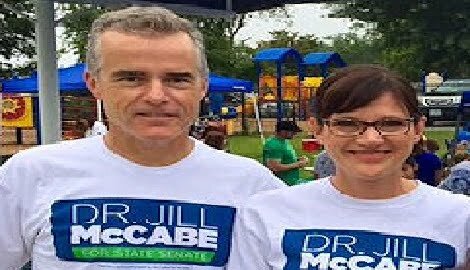 Records show McCabe attended a meeting in March 2015 with McAuliffe designed to secure the governor’s support of Jill McCabe’s candidacy. McCabe has said he sought FBI legal advice on how to deal with his wife’s campaign. He nonetheless presided over the Clinton email case until just a few days before it was closed, when he unexpectedly recused himself.